My Blog: Salute to our phriend Phil. I was given this attachment today, Feb. 2nd 2009, Ground Hog's Day and I see that it's going to be very inappropriate! 'Cause there's no reason for these guys to be mad. 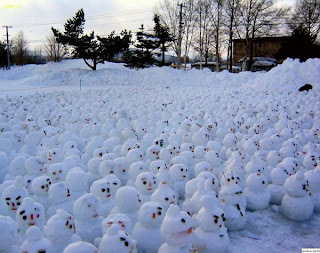 This is a photo of a Global Warming Protest... and boy are these guys ANGRY! Just check out the looks on their faces. There's that one guy in the front who looks like he's about to spit ice! It's a wonder they didn't throw any snowballs! I'm so sure that they hail Punxsutawney Phil as their leader this year. Phil saw his shadow for the first time in years and that means 6 MORE weeks of WINTER! Ok, I'm all for that snowy dusting and there are some friends of mine around the earth that have had more than their fair share of the white stuff. But Phil, come on... I know it was a clear, bright morning. But I'm sure with the overgrowth of trees up there on Gobbler's Knob that the last thing you saw was your own shadow! It probably was just your girlfriend standing next to you !